My cousin Michelle got married this weekend, and very sweetly asked me to make her wedding cake. I'll get to that, but first it's worth mentioning how gorgeous her wedding was. These pictures are terribly lit, and don't do it any justice, plus they only cover a couple of the amazing details. You could really see Michelle, and her mom, Carol, in every piece of the wedding, and they put together most everything themselves - the family printing company even did the colorfully chic invitations and stationery. I'll repost this in a month or so, when the professional photographs go online. The cake had tiers of carrot cake (filled with tangy cream cheese frosting) and chocolate cake (filled with chocolate mousse). It was frosted entirely with cream cheese frosting. Read on for more wedding pictures, and the recipe and instructions for this three-tier cake (plus an extra 6" bride-and-groom's cake). I was delighted, a couple of months ago, to receive this beautiful invitation package in the mail. They were printed in Hapeville, Georgia, by Martino-White Printing (though generally I think the company mostly does business printing). I thought the fonts and colors were perfect, and they were recalled in different elements of the flowers, ceremony, and reception. I can't wait to put up more, better, pictures from the wedding - including a better Still Life With Goldfish! Michelle had originally asked about carrot cake, and I told her I had a great recipe, and that cream cheese frosting would work well for the white-on-white look she wanted. But a few weeks before the wedding, Michelle re-evaluated the pastry plans, and, citing an informal (and obviously faulty) survey, she claimed that no one seemed to like carrot cake, and that we should do chocolate instead. I'm not a fan of the "It's your day - throw budget, caution, and taste to the wind, and do exactly whatever you want" school of wedding planning, but as someone who served coconut cake at her own wedding, I believe some personal tastes are sacred on one's wedding day. Michelle had originally been so excited about carrot cake, and I cited my own informal poll, concluding that we should at least make the middle layer out of carrot cake. So the recipes follow. I don't mind saying that this cake was fantastic (thank God, because I was unbelievably nervous - my whole culinarily gifted family was there!). Both portions of the cake were really moist and rich, and nothing like that dry, refrigerated, dubiously-almond-flavored confection that "wedding cake" sometimes evokes. A large cake leveler (I've mentioned my $3 leveler before; this larger one is really helpful, but not crucial, and it is decidedly not $3). This cake actually bakes really evenly; you don't need to use heating cores or nails for the 10" or 6" cakes. Preheat oven to 350°. Cut parchment for the bottoms of two 10" pans and two 6" pans, and butter the sides of the pans. In a large bowl, beat together the eggs, oil, sugar, and vanilla. Sift in flour, baking soda, baking powder, salt, and cinnamon. Stir until blended. Stir in carrots. Fold in pecans. Divide batter between the four pans so that the batter is an equal depth in all the pans - you can measure with a toothpick or a plastic ruler. Bake in preheated oven, rotating pans after 10 minutes. Check for doneness with a toothpick every six minutes or so after that. When cakes are done, remove from the oven and place on a rack to cool for 5-10 minutes. Run a knife around the pan's edge, and invert to remove cake. Let cakes cool completely on a rack. Preheat oven to 350°. Cut parchment for the bottoms of two 14" pans and two 6" pans, and butter the sides of the pans. Place a heating core in the middle of each 14" pan, and place an upside-down decorating nail into the center of the 6" pans. In a large bowl, combine the flour, sugar, cocoa, baking soda, baking powder and salt. Make a well in the center and pour in the eggs, coffee, buttermilk, and oil. Mix until smooth; batter will be thin. Divide the 3.5 batches of batter between the four pans so that the batter is an equal depth in all the pans. Pour a small amount of batter into the heating cores. In glass bowl, microwave cream just until boiling. Place chocolate in a medium bowl, and pour hot cream over chocolate. Let stand 2-5 minutes, then stir until smooth. Refrigerate, stirring every few minutes, until mixture is still soft, but no longer liquid. Using a chilled whisk attachment in a chilled bowl, whip cream to firm peaks; cover with plastic and refrigerate until firm, about 2 hours. Melt the chocolate, and set aside to cool slightly. In a small saucepan, bring the sugar, corn syrup, and 1 tablespoon water to a boil over medium heat, and cook until mixture reaches 238° on a candy thermometer, about three minutes. Remove from heat. With a whisk attachment, beat the yolks on medium-high speed until lightened, about three minutes, scraping down the side of bowl as needed. With the mixer on medium speed, gradually pour the sugar syrup down the side of the bowl in a slow, steady stream. With the mixer on high speed, beat until the mixture is thick and holds a ribbon-like trail, about three minutes more. With a rubber spatula, gently stir in the melted chocolate, the Grand Marnier, and the extract to combine. Gently fold in the whipped cream until the mixture is well combined. Chill at least four hours, or up to two days, before using. Mix together cream cheese and butter until well blended. Add powdered sugar, and mix slowly to incorporate. Add vanilla, and mix on high until fluffy. Mix together cream cheese, butter, and shortening until well blended. Add powdered sugar, and mix slowly to incorporate. Add vanilla, and mix on high until fluffy. Trim the top of each cake with a long bread knife or a cake leveler. Pick the tallest chocolate cake of each size, and torte them (slice in half lengthwise to make two layers). Do not torte the carrot cake; it's impossible with all the nuts. Place the tall untorted layer onto a cake circle. When chocolate ganache is soft but not liquid, fill a Ziploc or pastry bag with it, and snip a large hole at the tip. Pipe a dam around the layers of chocolate cake that you have not torted, and on one of the layers that is torted. Leave one thin slice (in each size) undammed - this will be your top layer. Allow ganache to harden. Divide the chocolate mousse evenly between the two dammed layers of each size; spread smooth. Place the thin layer on top of the thick (untorted) one, and place the final thin layer on top. Cover loosely with plastic, and refrigerate. Place the tallest carrot cake of each size onto a cake circle. Divide about half the tangy cream cheese frosting between these cakes (you'll save the other half to make a crumb coat over the entire cake). Pile the frosting on so it's nearly an inch thick. If it's easier for you, use a pastry bag to pipe the frosting on in layers. Place the remaining cakes on top. Place the large cake onto a cake turntable. Place large dollops of tangy cream cheese frosting on the top of the cake, and use a large offset spatula to push the frosting out towards the sides of the cake. Always push the frosting from above; if you pull the frosting, you'll pick up more crumbs. Position your spatula diagonally on the side of the cake, so that the tip of the spatula is down near the turntable and your hand is forward, and near the top of the cake. Push the excess frosting from the top, down towards the bottom of the cake, so that your cover the sides of the cake. If needed, dab on more frosting where there are empty spots. Once the sides are covered, position the spatula so that it is straight up and down, and rotate the turntable to smooth the frosting all the way around. Excess frosting often builds up at the edge where the sides of the cake meet the top. Position your spatula at the base of the excess, and rotate the turntable, shaving off the excess frosting. Place the cake in the refrigerator, and repeat with the other cakes. Reserve a very small portion of the frosting for decorating. When the frosting has firmed up on the first cake you crumb-coated, remove it from the refrigerator and place it on the turntable. Repeat the frosting process, now using the firm frosting. Complete through the last step of shaving off the excess edge frosting. Now wet a very clean finger, and gently run it around the edge, smoothing the corner. Return the cake to the refrigerator, and repeat with remaining cakes. This layer of frosting will acquire a matte, crusty film due to its higher sugar content. When the first cake has once again firmed up and acquired a film, return it to the turntable. Moisten a brand-new, chemical-free sponge, squeezing out excess water. Run the sponge around the sides and top of the cake, rotating the turntable. Then run the sponge around the corner edge. You will likely have some remaining stubborn spots of roughness. Wet your finger (once again, washing very well first), and rub at rough spots with your finger. With the sponge and a finger, you can smooth the frosting until it almost has the smooth, matte finish of fondant (but without the horrible taste and texture). Michelle wanted sugar crystals (small bits of rock candy) to catch the light of the candles at the reception. I made regularly-spaced marks with a toothpick around the circumference of each cake, and then filled in the top of each tier with piped dots of tangy frosting (more adhesive than the firm), in a scalloped pattern that crested at each mark. Then my intrepid bakery assistant, Allen, helped me stick pieces of rock candy to each dot, discarding too-large or too-small pieces. The first two tiers must have hidden structural reinforcement to support the weight of the top tiers. Take a 1/8" wooden dowel, and insert it as far as it will go into the middle of the bottom tier. Mark the height. Remove the dowel, cut it to length, and then cut four other dowels to the same length, plus one length of 1/4" dowel. Insert the 1/4" dowel into the center of the cake, and insert the five 1/8" dowels around it (make sure you're inside the diameter of the next tier!). Repeat for the middle tier. I left the cake unassembled until its delivery at the hotel. The largest tier was already on its stand. I wish I had a video of me, Allen, and my mom, each with one or two huge cakes in our laps, trying to find the hotel's shipping and receiving entrance. It was very professional. At the hotel, I used a bench scraper and an offset spatula to lay the next tier on top, followed by the smallest tier. 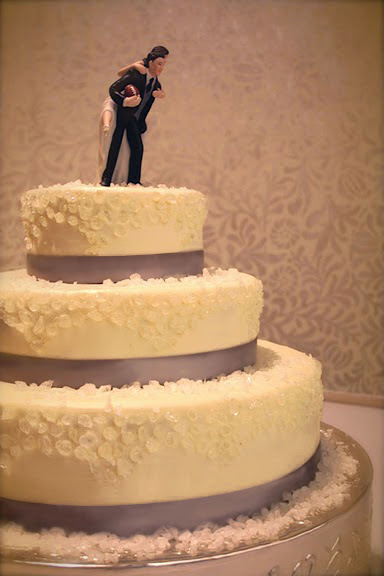 Choose whichever 6" cake is prettiest, and place it on the top; conversely, use whichever flavor the bride and groom didn't request for their personal cake. I laid a 1"-wide length of silver satin ribbon at the base of each tier, pulled it taut, and used a dot of hot glue to secure the ends to each other. I followed it with another ribbon on top, since some oil will seep through the ribbon. I was completely unprepared to deal with a cake topper. First, we just set it on top, where it threatened to topple immediately. So we cut a length of bamboo skewer to rest under Mr. Groom's left foot, and put a bundle of five or six full-length skewers inside a hole in the bottom of the figure. Was it designed for that? I have no idea. I do know that it didn't fall down. Finally, I sprinkled more rock candy loosely on the top of each tier, and on the bride's and groom's mini cake. The hotel staff decorated the table beautifully, but all my pictures are from before that. I'll post those pictures when they're available. Of course, all I could see were the cake's flaws, like the oil that seeped through the ribbons despite double layers. But once it was surrounded by candles in the dark room, that was hard to notice, and Michelle seemed genuinely excited about how it looked. And, honestly, the cake was delicious. The chocolate will be my new go-to for every occasion. And, despite carrot cake's less universal popularity, it was even better than the chocolate. The moistness and lightness of both these cakes have me swearing off butter cakes forever, I think. Are you ready to make your own wedding cake?! PS. Thanks, Jessi, Julie, and Jessica for the cake turntable (it was a wedding present)! I am your humble craft servant. Bravo, Elizabeth! Sooooo pretty and yummy-looking! I am always amazed at your attention to detail, which is very well displayed in this work of cake-art! I just licked my screen - jk...I did consider it though. I was fortunately able to sample both the chocolate and the carrot cake - and they were both equally delicious. As well, I somehow became the recipient of pounds of rock candy and, as we all know, you can never have too much rock candy in the cupboard! The looks amazing and sound delicious.